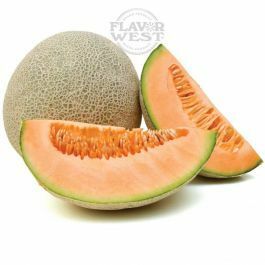 Cantaloupe flavor delivers a fresh ripe and sweet fruity flavor. You feel the same nutritional values in your treats. This flavor is sure to revamp your taste buds at all time. Type: Cantaloupe Water Soluble Flavoring. Ingredients: Natural and Artificial Flavoring, Propylene Glycol. USP Kosher Grade Flavoring. Usage Rate: 15-20% for E-use. Flavor suitability: Desserts, pastries and baked treats, yogurt, ice cream, candy and more. Specific Gravity: 1.03 No Refunds on Flavoring. This flavor is surprisingly good and is a great summertime vape !